If you have read James I. Robertson’s biography of Stonewall Jackson, you know what a daunting task it is. Seven hundred and sixty-two pages of small print that spares little in the life of this legendary Confederate general. It is fascinating, rich in detail, but I have to tell you the biography spent the better part of a year on or near my night table as I nibbled my way through it. This article, however, is not on the life of Thomas Jonathan “Stonewall” Jackson. Rather it will focus on his death and on the day that his body traveled through Lynchburg on its way to his final resting place in Lexington. 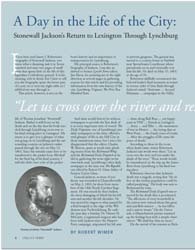 My intent is to give you a glimpse of what was going on in Lynchburg and the surrounding counties as Jackson’s casket passed through the city on May 13, 1863. Since his remains came here to be transferred to the packet boat Marshall for the final leg of his final journey, I will also delve into a bit of the packet boat’s history and its importance to transportation for Lynchburg. About the author: Robert Wimer retired in 2006 as editor of the editorial page of The News & Advance, a position he held since 1983. He joined The Daily Advance in 1972 and later covered state politics and the General Assembly for both The News and The Daily Advance from 1978 to 1980, when he became city editor of the combined newspapers. He is a graduate of Hampden-Sydney College, where he received a B.A. degree in history and political science, and a veteran of the U.S. Army. He lives in Amherst with his wife, Betty.